Ice Capades – New Iceberg Not What It is "Cracked Up" To Be | Watts Up With That? In it, an admonition: “Watch the media now as this story is only about an hour old.” So far the media (and foot in mouth politicians) haven’t disappointed in their zeal to make this “business as usual” for a glacier into a poster child. Professor Andreas Muenchow became a media celebrity this week with his quote about an iceberg in Greenland being “four times the size of Manhattan.” This iceberg has become a poster child for global warming, even though a much larger one broke off the same glacier 50 years ago. Researchers last week spotted a 100-square-mile chunk of ice that calved off from the great Petermann Glacier in Greenland’s far northwest. It was the most massive ice island to break away in the Arctic in a half-century of observation. The huge iceberg appeared just five months after an international scientific team published a report saying ice loss from the Greenland ice sheet is expanding up its northwest coast from the south. Changes in the ice sheet “are happening fast, and we are definitely losing more ice mass than we had anticipated,” said NASA’s Isabella Velicogna. In what he calls ‘a manifestation of warming’, Dr Richard Bates who helps monitor the Greenland ice said he was ‘amazed’ to see such a huge area of ice break off the Petermann glacier. Reported in the Telegraph a team from the University of St Andrews said that a huge 106 square mile chunk of ice had broken away at the start of August. This is the largest ever seen to come from Greenland. The US National Ice Center has named the iceberg the ‘Petermann Ice Island’. 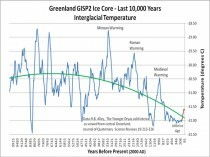 They also report that the Petermann glacier, which is located in North West Greenland to the East of the Nares Strait and one of the largest in the Northern hemisphere, has retreated back to a level not observed since 1962.
years of data on the glacier itself show that after this month’s event, the mass of ice is still, on average, discharging about the same amount of water it usually does – some 600 million cubic meters a year, or about 220,000 Olympic-sized swimming pools. “Even a big piece like this over 50 years is not that significant. It’s just the normal rate,” he said. Muenchow warns people not to jump to conclusions. “An event like this, this specific event, all flags go immediately up, ‘Oh, let’s explain this by global warming.’ I cannot support that,” he said. So what we know is that the glacier is where it was 50 years ago, a bigger chunk broke off 50 years ago, and the rate of ice moving to the sea has not changed. There is absolutely no story here. Our warming friends get more desperate by the day. It is pathetic. August 13, 2010 in Arctic, Glaciers, media. Theres none so blind as cannot see! everything is as they expect it to be, for them there is no other way. Hmm, I think you’re on to a scoop here. Penguins on a Greenland iceberg. What won’t they think of next. I particularly like the Arctic penguins. A new species perhaps? The “green industry” has tied it’s wagon to the global CAGW myth which is rapidly loosing it’s political steam. They stand to loose big time if cap and tax legislation or EPA regulations are not enacted. There will be a lot of political issue ads and bad “science” releases between now and November trying to keep CAGW politicians in office. It’s not about science. It’s about research funds and carbon offsets. Summer of the Shark meet the Generation of Global Alarmism. Yes , it is pathetic . But did you expect less than the worst in media coverage ? Interesting how just adding “of observation” to that sentence makes it sound like: In all the time we’ve been observing the Arctic, this is the biggest ever.” Sounds a lot more dramatic than: “The last time this happened was 50 years ago when a much larger one broke off” What he wrote was true, but readers will be misled, perhaps intentionally? Whatever happened to having honor and integrity? The warmers and the lap dogs in the media have neither. I know it is a lousy translation by Google, but it is too late for me to do it myself. Make no mistake – DMI has both feet firmly planted in the Warmers’ camp. It’s a bit like splatter movies. The acting and the plot don’t matter as long as enough blood flows. News has become a subgenre of B movies. Equals more grants for studying the Greenland ice sheet…. More careers cocooned in soft fluffy science where rose-tinted glasses are part of the uniform. 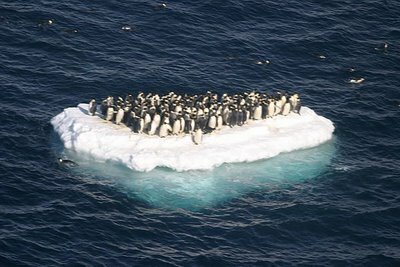 Penguins stranded on a mini-iceberg. Heart-wrenching, but I’m not going to give up carbonated soda pop. On a similar theme but different subject. They’re all jumping on this iceberg like a pack of starving wolves. Of course it’s pathetic, all they have left is pathos. To people like this – Isabella or Bates, nothing existed prior to their birth. That was my first reaction – it’s desperation. yes, crop yields which are actually increasing are said to be catastrophicaly failing because of global warming. glaciers, which are actually growing, are said to be collapsing because of global warming. Anthony PS: I have a couple hours of 8mm color film my father took on a trip to Antarctica back in the ’50’s of giant icebergs when he was on a Navy icebreaker. If you are interested, email me. In colder climates glaciers will tend to grow their tongues much further on the sea than in a warmer world. Eventually, they break off even if it is cold. Almost every credible source, I have found, begins with this “poorly understood” caveat. No kool-aid for the glaciologists. The combined global land and ocean surface temperature made this July the second warmest on record, behind 1998, and the warmest averaged January-July on record. The global average land surface temperature for July and January–July was warmest on record. The global ocean surface temperature for July was the fifth warmest, and for January–July 2010 was the second warmest on record, behind 1998. The “bigger chunk” in 1962 was from the Ward Hunt Ice Shelf, northern Ellesmere Island in Canada. Is the Ward Hunt Ice Shelf considered part of the Petermann Glacier? OMG! Is that us?! We are SO CUTE! The media’s turned into a poitically correct new Chicken Little — The ice is melting! The ice is melting! And they can always count on a few ethically challenged scientists to join in the chorus just to keep that AGW money machine pumping out the green. And those that don’t toe the propaganda line can be safely edited out. He was my 2 cents worth on the matter. The ice floe upon which an entire fishing village has been carried from the neighbourhood of Bjorko Sound has become stranded near the island of Seibkar. There are 253 men and a number of horses on the floe. Despite the fact that the temperature is 18deg. below zero, the fishermen refuse to abandon their huts and horses and an extraordinary fine catch of fish which they had secured. Their position is not dangerous at the present time. I feel bound to inform you, brother Goddard of another enemy who also threatens the security of our Village. He is one professed glaciologist Konrad Steffen who claims to be of the University of Colorado, but who (on the side) is overseeing the Greenland section of a major report by the UN IPCC (Gasp!…the source of all climate lies) due in 2013. So, just to be clear, here we are in range of arctic sea ice minimum (another month or so), tracking more than 6M km/2 of floating ice, and they’re having a hissy over ~260 km/2 of new floating ice? Is that right? GeoFlynx – The “much larger one” was from the Ward Hunt Ice Shelf (1962), northern Ellesmere Island in Canada. The Ward Hunt Ice Shelf in Canada is NOT the same as the nearby Petermann Glacier in Greenland. Steve G., I think you need to take one for the team here. Send Revkin an email and tell him that if arctic minimum extent comes in at 5,500,000-5,500,260 km/2, we’ll still consider you to have missed because of the unfair recent addition. Maybe that’ll chill them out. This is a perfect example of why people are turning away from believing. I say encourage them to do more of this. Aaah…Holger D. Wasn’t it better in the good old days? Scientists say a lot of things. If, might, could. They even pretend to know the future. Fortunately there are still enough sane people not buying into everything they say. Now don’t you have a dinner date with Joe Romm? geo @ 3:55 PM: Good question and, yes, that’s what they seem to be saying. NPR had a breathless account this afternoon of the catastrophe with some warmist “science” interlocutor explaining how even though the air isn’t warm enough to melt anything, the ocean is full of heat and eats away at the ice from below and it breaks off, plus Greenland is seeing all sorts of ponding of water on the ice cap which cuts its way through the several kilometers of cap (evoking images of an oxyacetylene torch on butter), and yes all this could and probably should be attributed to global warming. The advocacy requires constant close focus on a few events that can be posed as lurid or spectacular, and then surrounded with some generalization as if the same thing is happening everywhere. Think how disaster movies are made: a pornographic close-up of the fire starting or the building teetering or the wall of water rushing toward shore; then endless variants of same; then cut to faces of victims with frozen expressions of horror; repeat as needed. It has nothing to do with the systematic and principled collection and interrogation of data over time and space. It’s been a summer of near biblical climatic havoc across the planet, with wildfires, heat and smog in Russia and killer floods in Asia. But the moment the Petermann glacier cracked last week — creating the biggest Arctic ice island in half a century — may symbolize a warming world like no other. “It’s so big that you can’t prevent it from drifting. You can’t stop it,” said Jon-Ove Methlie Hagen, a glaciologist at the University of Oslo. Few images can capture the world’s climate fears like a 100-square- mile (260-sqare-kilometer) chunk of ice breaking off Greenland’s vast ice sheet, a reservoir of freshwater that if it collapsed would raise global sea levels by a devastating 20 feet (6 meters). The world’s newest ice island already is being used as a powerful emblem in the global warming debate, with U.S. Rep. Edward Markey of Massachusetts suggesting it could serve as a home for climate change skeptics. Researchers are in a scramble to plot the trajectory of the floating ice shelf, which is moving toward the Nares Strait separating Greenland’s northwestern coast and Canada’s Ellsemere Island. If it makes it into the strait before the winter freeze — due to start next month — it would likely be carried south by ocean currents, hugging Canada’s east coast until it enters waters busy with oil activities and shipping off Newfoundland. “That’s where it starts to become dangerous,” said Mark Drinkwater, of the European Space Agency. The Canadian Ice Service estimates the journey will take one to two years. It’s likely to break up as it bumps into other icebergs and jagged islands. The fragments would be further ground down by winds and waves and would start to melt as they move into warmer waters. “But the fragments may still be quite large,” warned Trudy Wohlleben, a Canadian ice forecaster, who first spotted the massive chunk of ice on satellite images last Thursday. The chunks of ice could be large enough to threaten Canada’s offshore platforms in the Grand Banks off Newfoundland, said Wohlleben. Moving an offshore platform is time-consuming and expensive â€” and very complicated in cases where they are fixed to the ocean floor. While Greenland’s glaciers break off thousands of icebergs into Arctic waters every year, scientists say this ice island is the biggest in the northern hemisphere since 1962. It contains enough freshwater to keep the Hudson River flowing for more than two years, said Andreas Muenchow of the University of Delaware. The drifting ice sheet is likely to remain at the heart of the global warming discussion during its journey. While experts say it’s difficult to directly tie the giant ice island to climate change because there are so many factors that affect glaciers in the area, the unusual event coincides with worrisome signs of warming in the Arctic. Since 1970, temperatures have risen more than 4.5 degrees (2.5 degrees C) in much of the Arctic — much faster than the global average. In June the Arctic sea ice cover was at the lowest level for that month since records began in 1979, according to the National Oceanic and Atmospheric Administration. The retreat of Greenland’s glaciers, which has accelerated in recent years, is one of the least understood pieces of the climate puzzle. A team of climate scientists who visited the Petermann glacier last year, expecting it to crack then, is now planning another trip within weeks. “We did leave behind a couple of time-lapse cameras and 11 GPS (devices). Now we are scrambling to get up there and recover the data,” said Jason Box, an expert on Greenland glaciers from the Byrd Polar Research Center at Ohio State University. Box and two British researchers traveled to the glacier last year with Greenpeace activists who offered space aboard their ship, the Arctic Sunrise, to scientists studying climate change. They were hoping to capture the event with cameras rolling, which would have been a powerful image just months before the Copenhagen climate talks that failed to produce a binding treaty to reduce heat-trapping gas emissions. Still, she finds it ironic that the Petermann breakup coincides with another catastrophe linked to fossil fuels. The Arctic Sunrise is now in the Gulf of Mexico, surveying the massive oil spill from the Deepwater Horizon blowout. Nah. No scare tactics or exaggerations here. By the way, the “ice island” in question is INSIDE a narrow, twisting fjord, now about 3/4 – 1 mile from even the OPENING of the fjord in Greenland. But a so-called glaciologist is claiming it is in “open seas” ???? Is this a credible “expert” or does it represent the level of knowledge and real-world experience of today’s “average” CAGW-spouting glaciologists? The “island” is no larger than Manhattan – which will permit it to BECOME a large iceberg – WHEN it gets out of the fjord – IF it can! – and WHEN it starts melting as it goes south (many hundreds of miles) towards the shipping lanes. But right now? It’s trapped and can do nothing but melt. Or re-freeze into the tip of the glacier since the Arctic temperatures at 80 degrees north latitude (which cuts across north Greenland) are trending back towards 0.0 Celcius, and will go below freezing in about two more weeks. The connection between the Greenland ice breakup and the Russian bog fires and the Amazon draughts and the Austrailian political situation and the Japanese economy and the heatwaves in the American southern states cannot be stressed enough. Everything that happens on this speck of dust in the middle of nowhere in this galexy so far, far away from anything really exciting in the universe is all connected. No ’bout a’doubt it! They must be getting tired; I know I am! Given those are penguins that iceberg is from Antarctica, not Greenland. Not that the AGW crowd would notice. They will probably have a visual using polar bears for Antarctica in the next gloom, doom, and gore report. Well then how did it get bigger since 1962, so it could retreat back to where it was in 1962? I’m impressed with your ability to parrot government statistics! 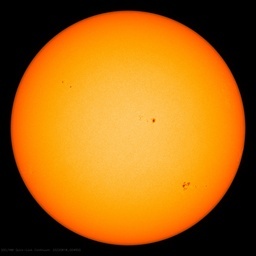 However, I don’t think NOAA or NASA need your help with dissemination of their ‘official news’. They’ve got taxpayer-funded information officers and PR staff for that. At this late date, I think you should know better than to blindly accept press releases from any government agency. I think it was that radical anarchist, Albert Einstein, who once said something like: “Unquestioning acceptance of authority is the greatest enemy of the truth”. I think you may fall into this ‘unquestioning’ category. And my 84-year old Mother watched this “news” on CNN and ate it all up – mega warming included. “OMG” was the gist of her reaction while on the phone today. Being’s she is an avid reader I’m sending her a copy of “State of Fear” tomorrow. What’s up with Revkin? I haven’t been following that thread. More Ice Islands…including mention of one 60 miles by 40 miles! Too bad the continental US doesn’t calve off that festering cesspool known as D.C.
SSam @ 6:20. Ding ding ding ding! We have a thread winnah! I have to ask a really dumb question. Isn’t it only ADVANCING glaciers that calve? I would think a retreating glacier wouldn’t calve but rather melt back from whence it came. This may, indeed, be an omen…but it seems as though it is a harbinger of advancing glaciers. Of course it might also be that’s it’s freakin’ AUGUST in the northern hemisphere! He can’t get the funding? Must be a good scientist. 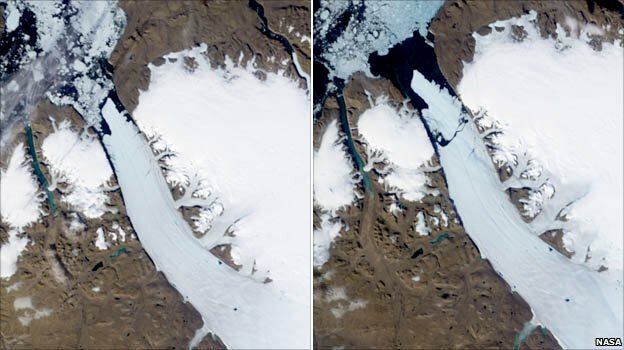 Changes in the Arctic are happening fast, with Greenland pumping out vast quantities of glacial ice. The snow precipitation factor must really be hitting high gear, as that ice front that broke off was 15km further south just 3 years ago. 5km/year glacier flow indicates it was shoved much more than merely flowing. Do the math on the 2 pics in the origininal thread here. Tell me my math is wrong. And, if the frantic shoving of ice tongue isn’t enough, just this week, temperatures north 0f 80N fell below zero in what is turning out to be the coldest year on the DMI 80N record. Look at the both of these quotes, from different news sources. Muenchow warns people not to jump to conclusions. “An event like this, this specific event, all flags go immediately up, ‘Oh, let’s explain this by global warming.’ I cannot support that,” he said. Curious @ 2:58 color film ! If you haven’t already recreated that to digital now would be a good time. Well, ponds beget trickles, and they become streams, and then rivers and then they produce a Moulin. Because of the noise made (the sound of a busy grain mill) such a melt-water cascade into a glacier is called “moulin” – using a French term. The previous one lost half its mass in the first 2,000 km. So, what’s up with the new (current) one? any pictures or maps? So let me get this straight , climate scientists must cross every “t” and dot every “i”. But you get to post pictures of birds that don’t live in Greenland , when writing about Greenland ? This iceberg has become a poster child for global warming, even though a much larger one broke off the same glacier 50 years ago. I assume you mean the Ward Hunt Ice Shelf in 1962 which is located at Baffin Island , Canada , not Greenland. Nice, mix ice shelves and outlet glaciers from different countries . Oh, I just picked Revkin as an example of the MSM for my jape –substitute any byline from the heavy-breathing articles on this subject that you care to for the same intended effect. Ummm…it is called a joke. Anyway, haven’t you seen the Coke commercial with the Polar Bears and Penguins partying together? The last time such a massive ice island formed was in 1962 when Ward Hunt Ice Shelf calved a 230 square-mile island, smaller pieces of which became lodged between real islands inside Nares Strait. This would make this whole post a work of fiction. All I know is you guys said that the Peterman calved an ice berg ” 50 years ago ” , it didn’t. So “What’s Up With That” ? We’re not discussing what some congressman said, we’re discussing the fact that you folks got a basic fact wrong, and I have the screen shots to prove it. Why not use it rather than let it melt.All we need to do is add some sawdust and engines etc we could make the biggest cruise liner ever. Look up Pykrete and ice ships known as project Habbakuk. Fit it with a Thorium reactor to power the cooling plant and it would last for years, they don’t melt very quickly even in warmer seas! And the whopper here about the Peterman calving a 230 sq. mile ice berg in 1962 when it didn’t. I wonder if the glacier chunk breaking off might have more to do with an as yet unreported drop in sea level. The only word real scientists use in their statements is “IS”! Chink!! Funding gone, pay your own air fare, man’s an idiot 😉 but honest. Now there’s novel for a climate scientist. Now this has got to be pure coincidence surely or do you think that perhaps the move company The Aslyum have paid some marketing company to promote Assoc. Prof. Andrew Muenchow recent work? I’ve just been watching cable TV and was a bit gobsmacked to find this move being shown on the the SyFy channel this morning. Yes, Titanic II is a disaster movie (due to be released on DVD in the US next week)which takes place in April 2012, 100 years since the sinking of the RMS Titanic. A new luxury cruise liner, the Titanic II, has been christened, and is soon to embark on her maiden voyage, on the same route the Titanic took 100 years before. During the voyage, the effects of global warming cause a section of a carving glacier the size of Rhode island in Greenland to break off and to produce an enormous tsunami that sends an iceberg crashing into the Titanic II, leaving it to the same fate of her predecessor. He got it right the first time, though. Ummmmmmm — could you repeat the question, please? The photo makes me think of the alarmist penguins and their Lapp dogs huddling together on the last remnant of the continent of lies they constructed. Re disinformation by RACook the route the ice island has to travel to reach the Nares strait is wide and straight not “narrow and twisting”, if anything delays its travels it will likely be inadequate depth. Is there some part of this statement which is confusing to you? Are you a “can’t see the forest because of one tree” kind of person? If the sea levels are indeed dropping, the Panama & Suez Canals are in shallow trouble. Using that line of logic, if you have a single hair on your body, then you are a sasquatch. If one error makes a document a “work of fiction” then the IPCC report is completely negated dozens of times over. “Box and two British researchers traveled to the glacier last year with Greenpeace activists who offered space aboard their ship, the Arctic Sunrise, to scientists studying climate change. A bunch of purportedly non-biased “climatologists” team up with green piece radicals to produce a little climate theatre in order to influence global politics. They seek to portray a normal event as some kind of proof of an impending klimate katastrophe, but mother nature didn’t cooperate in the con game. The question for the warmists is, would it have been justified to use explosives to help mother nature along a little bit? Afterall timing is everything. You have to break some eggs in order to ‘save the pwanet’. Walter Cronkite lives on in journalism. Someone wrote when he said, at the end of his broadcast, thats the way it is it was what he wanted it to be. Hopefully that attitude is not bleeding over into science. GeoFlynx – I had been trying to point out earlier that the Ward Hill Ice shelf in Canada and The Petermann Glacier in Greenland were not the same. However, I do support Steve Goddard that this fact has not been made very clear in the recent press. Serious climate scientists have not made much of a fuss over the Petermann calving in the sense that a single solitary event, taken out of context, does not in itself form a “proof”. I’m afraid that the world press has over reacted on this one. But you claim it’s a “straight path” to the sea? Look at the satellite photos. The ice island is a long block, approximately 2.5 times longer than it is wide. It is in a fjord averaging only 15% wider than the ice island’s width, so unless the ice island moves directly and perfectly (only +/- 7.5 percent rotation allowed while randomly drifting in the current out of the fjord) in the centerline of the fjord north for 3x its length, it will jam in the Peterman Glacier outlet while it continues to melt. Then, all the sea ice chucks and glaciers between end of the fjord and the sea has to move out of the way, or it will jam between the walls of the Nara Strait and the jammed in sea ice – which will also block movement of the ice island. However, even in the somewhat wider Nara Strait, the ice island must either be smaller (melting away) or not rotating at all, or it will still jam into the walls of the strait. I predict Phil. will not say, “I was wrong,” but will either jabber away trying to hide that fact, or will simply disappear for a while. So you managed to find a source called “the chatter box” that reported the same thing within 24 hours. 1. Can anyone tell me the best source of current satellite photographs of this area? 2. Can we have a thread on the NW and NE passages? The NW looks very nearly open now, and the NE just has a blockage between the Kara and Laptev seas (at least I think that’s the correct geography). What ships are attempting which Northern Passages? This uncertainty, delay, liability, increased insurance and other costs of using the Northwest Passage are likely to deter commercial shipping here. A ship with a reinforced hull could possibly make it intact through the passage. But if it got stuck, it would cost thousands of dollars for an icebreaker like the Amundsen to come to the rescue. So even if the Northwest Passage is less ice-choked than before, the route may not become a shipping short-cut in the near future, as some have predicted. Earlier this year, ice specialists said to expect thinner ice. And, according to Environment Canada’s ice service, ice conditions in the Northwest Passage at the end of July resembled those normally found in the second or third week of August. That’s probably because last winter, no part of the central Arctic experienced colder-than-average temperatures and freeze-up occurred later. Air temperatures were also above normal throughout last year’s September to December freeze-up period, averaging from 1 to 5 C warmer over the central Arctic. The impact of this unusual warmth is still felt this month when ice, except for a few places in the passage, is lighter than usual. No, as your quotation of my statement clearly shows I did not say that! Which it clearly is not, one of us is telling the truth and it isn’t you as shown by your own post. Your subsequent post concerning the difficulty of the ice island negiotiating the Nares (sic.) strait has nothing to do with your original false statement, had you said that in the first place there would be no problem. PUBLIC DISSOCIATION FROM PENN STATE METEOROLOGY. Though it will mean nothing to them, it means plenty to me. I have to admit, I am a graduate of Penn State in meteorology (1978) and always looked at this as one of the achievements of my life. No more. Though I have a degree from the once proud and great meteorology department, it was EARNED during its glory day, when we graduated 2/3rds of the worlds meteorologists, and were the envy of other schools. That was yesterday, and yesterdays gone. My words will mean nothing to the people now running what was once the envy of the atmospheric science world, But they mean plenty to me. Penn State has lost its way. The recent events show you are not in pursuit of the answer, but an answer that people in control believe is pre determined and one that promotes an agenda, not science. So no mas, in the words of Roberto Duran. I will know longer refer to myself as a Penn State grad, nor promote the university in my appearances , which will be something they wont mind given the way they have to be thinking. . Those that I learned from there, they will always be my heroes. BUT THEY MADE PENN STATE.. PENN STATE MAKES NO ONE… at least the way they position themselves now. One can not imagine the betrayal I feel at the hands of this university. AND THAT SAYS IT ALL. While I am greatly pained in writing this, it matters nothing to the people that want to promote an agenda and shut down debate on a matter that I believe will have a completely different outcome from what they try to hoist on the planet It is the toughest thing I have gone through in my whole life. The fact is the university I busted my tail for, and defended all these years, is complicit in not only advancing an agenda driven matter in the name of “science” but also trying to suppress freedom of independent, rational thinking. Its that simple. Perhaps, time will prove me wrong. I almost hope it does, but I dont see it, I graduated in 1978. 30 plus years of ties that bind, plus actually bleeding and sweating in a PSU uniform on their wrestling team ( which by the way I still love and support) are a tough thing to cut. But the recent articles on “climate ethics” and other things pushed me over the edge. I have always been, right or wrong, honest with my audience though I admit I have avoided this matter. No more. And all because a green-as-grass PSU postdoc (Mann) in ’98 latched onto a cornucopia of outside political funding! It appears the negotiations for the sale of its integrity didn’t take much time. The Arctic was warm last winter because of the record low Arctic Oscillation, which was spilling the cold air out of the Arctic to lower latitudes like Europe. Mann was not a PSU postdoc! I assume that the rest of your facts are as reliable. He had just completed his degree; he didn’t have a postdoc position as such, I grant you. But he was a very ordinary junior PhD until he tapped the money vein for the department. The subsequent quality of his work, and his notorious (unwarranted) arrogance, are all of a piece. Jct: Great article. Great research. Wonderful to have to lies exposed so quickly, even if only to those of us who can still read. The penquins on the ice island remind me of the warministas, They’re getting a free ride. The difference is, the penquins are not trying to tell us that there is anything unusual going on here! I’m afraid the quality of your research doesn’t get any better. Mann was a post-doc at UMass until 1998, then a Research Assistant Professor at UMass until 1999 when he was appointed as Assistant Professor at UVa, a post he held until 2005. At which point he was appointed as an Associate Professor and Director of the Earth System Science Center (ESSC), Pennsylvania State University and promoted to full Professor in 2009. At no time could he remotely be described as a post-doc at Penn State nor as “a very ordinary junior PhD”! If you want to criticize Mann try sticking to the facts and not making up nonsense, it ends up undermining your case, and by association that of others. So there is a Greenpeace ship named Arctic Sunrise. Strange, I seem to recall learning that above the Arctic Circle, and likewise below the Antarctic Circle, is the land of the midnight sun, with “sunrise” occurring only once a year at the poles. Offhand this looks like the frequency of which this ship does anything remotely notable. It would be in Greenpeace’s best interest to rectify this situation immediately. To highlight the dangers of anthropogenic global warming and the unprecedented loss of Arctic sea ice, Greenpeace should promptly take the vessel on a cruise through the Northwest Passage, to clearly demonstrate how easily navigable it has become. Of course this must be done without the aid of icebreaker vessels, as they use either the horrendous dirty fossil fuels or the potentially more calamitous nuclear fuels, which is moot since such ships are obviously not needed anyway. Nice pic of the penguins. Is that from the Arctic colony that got started after the Animal Liberation Front rescued those penguins from their captivity at a Northern Canadian zoo and released them into their natural habitat? its alway over done by our enemies the reason why the BS Is out in the open is for control of us all. by the way the penguin guys look happy many fish in the sea and by the way Icebergs have been with earth for one billion years. Presumably those toffs in the coats and tails are the [snip] who have already colonized their [snip]land new home. Seems like that giant iceberg is quite lacking in the necessary understructure, as it seems to be floating a bit on the high side; despit all the freeloaders catching a ride on top. RE: Phil. and Gunther. I was unaware of these comments until today as I was traveling all weekend and did little moderating. Figure 1: Shows an ENVISAT image (©European Space Agency) of Petermann Ice Island (2010) dated August 5, 2010. I never made any claim of being the first to spot the actual calving event. Neither did Goddard. That honor apparently goes to the U.S. Navy Ice center on August 5th, though they don’t have a hourly timestamp so it is hard to be certain. Either way, whether it was this fellow Lockerby, UD, or the U.S.Navy, WUWT has made no claims of spotting the calving event first, only of being the first to publish the UD press release on August 6th. Hey Chasmod, of course you knew it was tongue in cheek. But if Anthony’s rule is that that word is on the Nyet list then I will refrain even in jest. Irrelevant. Does not address the issue of who was first to publish the news. Straw man argument! Ignoratio elenchi. Gunther gave proof: Steve Goddard was not first to publish the news – 6th August. Patrick Lockerby was actually first to publish the news – 5th August.